Today, she posted a link to the College of Physicians of Philadelphia‘s History of Vaccines blog, which I had never seen before. I could go on about how much information is out there in the internet, but I pick and choose what I read and don’t read. This blog will be on the “must read” list. I had vaguely understood that the anti-vaccination movement had a long history, but before the “vaccinations cause autism” fraud, I just lumped the anti-vaccination lunatics with the anti-fluoridation luddites. Well, I would be wrong. The Anti-Vaccination Society of America was active in the late 1800’s and early 1900’s, along with related and competing anti-vaccine groups. The post uncovered that it was run by a Frank D. Blue, who was secretary of the society and did most of its day-to-day work. Wow, that reads like the All-Star League of alternative medicine and anti-scientific beliefs. It is amusing that the same groups, 100 or more years later, still try to push the same denialism on the general population. OK, temperance might be a good thing, but the temperance movement of that time period was very religious. A story for another time. Similar to today’s anti-vaccination movement, the League’s activists also tried to influence news editors and the conversation about vaccines (at that time, smallpox vaccination). One document in the collection is a clipping of an article by Blue (no date) in Vaccination about effective ways that activists could respond to the resurgence of smallpox epidemics that occurred around the turn of the century. Blue says that he’s taking direction from a report of the American Humane Society and advocates measures including widespread circulation of the anti-vaccination periodical Vaccination (including specifically to newspaper editors and judges), establishing more anti-vaccination societies across the country, distributing tracts and other propaganda to the public, sponsoring prizes for essays and fiction on the “evils of vaccination,” and establishing a “press writing corps to write newspapers regarding vaccination facts.” Not mentioned in Blue’s essay is lobbying lawmakers, though in the collection is an English pledge intended for legislators to sign: “Will you vote AGAINST the enforcement of the Compulsory Clauses of the Vaccination Acts?…Will you vote AGAINST the practice of Vaccinating Children born in the Workhouse…” (dated 189X). He appears to have followed the news of smallpox outbreaks around the country and then written to local newspapers and judges to encourage them to resist public calls for vaccination in response to the outbreaks. Oddly, there’s no documentation of the 1900 lawsuit that Blue brought against the Terra Haute school board, attempting to invalidate the exclusion of his son from school for not having been vaccinated. 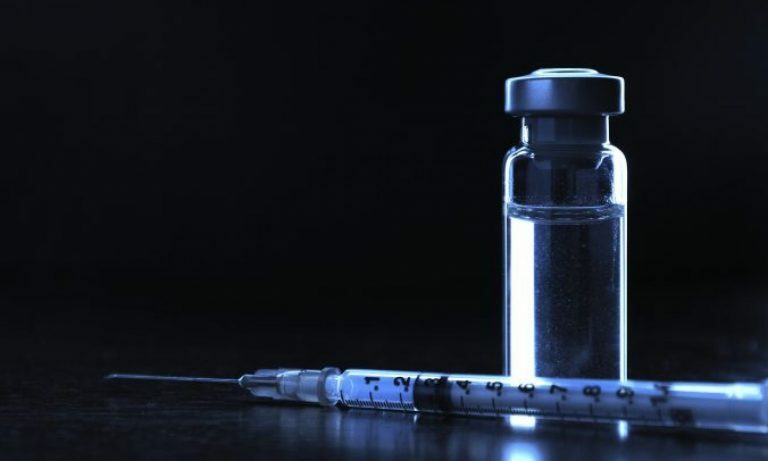 The suit went to the Indiana Supreme Court, which found that the school board was justified in excluding unvaccinated children during epidemics (Blue v Beach). Smallpox is a horrible disease with a fatality rate anywhere from 25-100%; survivors almost always had some lasting reminder of the disease from significant scarring to blindness. Smallpox is also implicated in the destruction of many pre-Columbian civilizations when white Europeans carried the disease from Europe to the Americas, where the disease was completely unknown, and there was little or no immunity to the disease. Smallpox vaccination is probably the first one in human history, possibly dating back to the Ming Dynasty in China. Our modern anti-vaccine lunatics probably are too young to remember the scourges of smallpox. Why is that? Well, I’m probably in the last group of adult Americans who received the smallpox vaccine, because we stopped vaccinating for smallpox because it was eradicated in 1979. And when I say “eradicated”, I mean completely gone. Giving credit where credit is due, vaccines ended smallpox. I’ll bet if smallpox was still a threat, anti-vaccinationists would be laughed out of the discussion. We often read that the proliferation of information on the Internet helps to amplify anti-vaccination arguments and misinformation about vaccines. That, of course, is very likely true. But the collection of materials in our archives is evidence of a thriving public information campaign around the turn of the century, with widespread circulation and seemingly effective public relations strategies (if it’s fair to use that term ahistorically). And while the Internet makes possible circulation of songs by the anti-vaccination band The Refusers, it’s interesting to know that the turn-of-century anti-vaccination movement had an equivalent. 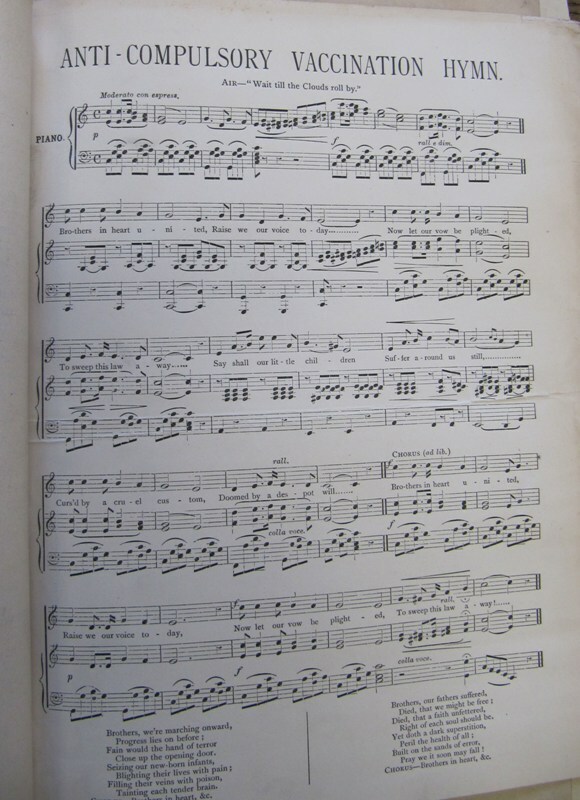 We found the sheet music for “The Anti-Compulsory Vaccination Hymn,” which we are happy to share with you here. via The Anti-Vaccination Society of America: Correspondence — History of Vaccines. Previous PostPrevious Antievolution and anti-science education–New York City?